On Saturday morning 465 volunteers headed off to work in Des Moines for a special once-a-year job: helping students stay on the path to graduate high school. The 10th annual Graduation Walk was held on Saturday, August 25. Begun as a way to engage recent dropouts to return to school, the effort is now more focused on getting ahead of the curve to support students before they leave school. The 2018 edition of the Graduation Walk reached out to high schoolers behind on credits, as well as high school and middle school students who had high rates of absenteeism or were otherwise struggling academically. The Graduation Walk is made possible thanks to support from United Way of Central Iowa and Wells Fargo. Volunteers started the morning at one of the district’s five comprehensive high schools, along with Scavo High School and Hiatt Middle School, before heading out in the teams to visit students and their families. 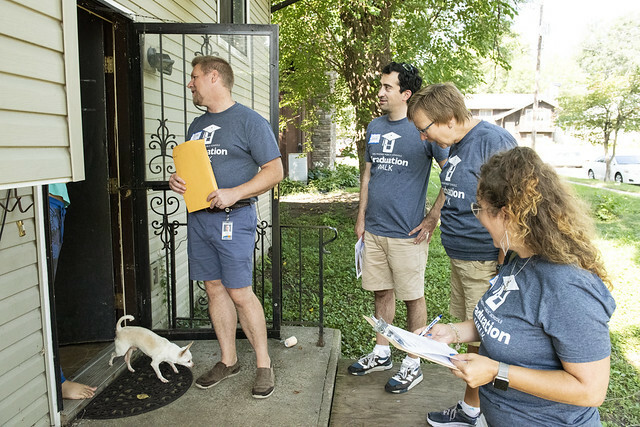 Thanks to the work of this year’s volunteers, the Graduation Walk visited a total of 1,713 homes and spoke with 837 students or family members. Volunteers on the Graduation Walk included dozens of employees from DMPS and Wells Fargo, supporters of United Way, community members supportive of education, and several public officials including State Representative Jo Oldsen and City Council members Chris Coleman and Josh Mandlebaum.